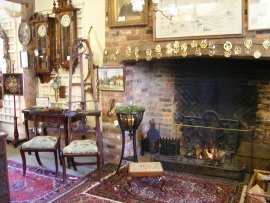 We are a datelined Antiques Centre situated in the heart of the Chiltern Hills, close to the Prime Minister's country residence of Chequers, displaying a wide selection of Town and Country antiques. Our lovely old mellow Tudor building has a wealth of features including 16th Century wall paintings, a spiral servants' staircase, inglenook fireplaces, and a resident ghost!! < Outside, an archway leads past the old stoop into a free car park where we have a fine display of gardenalia as well as a tea room. Established in 1987 we pride ourselves on being a quality Antiques Centre with emphasis on "ANTIQUES" - just ask the ghost!! Warmed with a "hug" from a welcoming log fire visitors wander through 8 rooms over 2 floors admiring an eclectic mix of furniture, pictures, ceramics, metalware, silver & gold, clocks, militaria, jewellery, textiles, gardenalia and much much more - in fact it's easier to list the things we don't have rather than those we do! !